Enjoy your favorite craft brew wherever you are with this growler and drinkware tote. 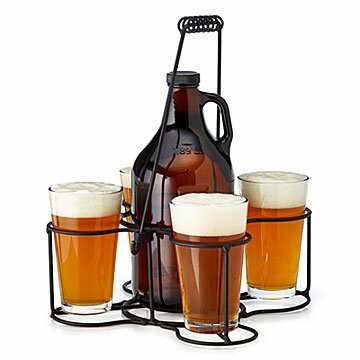 Take this beer growler and glassware tote to your next picnic, barbecue or tailgate party, and it's like bringing your favorite local brewhouse with you. The heirloom-quality tote is full of handcrafted details, from its wrought iron frame, to the removable handle and its lathe-formed metal coil. Perhaps the best feature of the carrier, however, is that it includes a quartet of actual glasses, which offer a grown-up alternative to sipping from a plastic cup. The set is also available without the growler, for anyone who already has their own. Tote handmade in Lancaster, Pennsylvania. Glass growler made in Toledo, Ohio. Hand wipe with a damp cloth. Growler is dishwasher safe. It was well-received and the glasses are good quality. The metal is sturdy and heavy-duty. It was just a little uneven when you use the handle to carry it.